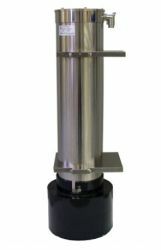 LOGAN, Utah – Campbell Scientific, with over 35 years of world-class measurement experience, is pleased to announce the new GMON3 Snow Water Equivalency (SWE) Sensor, produced by Campbell Scientific Canada and developed in collaboration with Hydro Québec. The innovative design of the GMON3 makes it an excellent sensor for non-contact SWE measurement applications. The GMON3 obtains a measurement by monitoring gamma rays that are naturally emitted from the ground. As snow accumulates on top of the ground, the GMON3 measures an attenuation of the normal background radiation levels. The higher the water content, the higher the attenuation of the gamma radiation. The new sensor measures with an accuracy of ±15 mm from 0-300 mm and ±15% from 300-600 mm, operating within temperatures from -40°C to +40°C. The GMON3 can output an RS-232 (1200 to 115200 baud) signal interface to Campbell Scientific dataloggers or other recording devices. It is effective with any type of snow or ice. Data can be transmitted in near real-time with the addition of a wireless communication option.